Model has a larger suction base which creates the hold | permanently attached suction bases help prevent messes and spills | top rack dishwasher safe | quick-release tabs on each suction base allow for easy parent removal | set includes three suction bowls that stack neatly together for storage | top rack dishwasher-safe and bpa free | model has a larger suction base which creates the hold | permanently attached suction bases help prevent messes and spills | quick-release tabs on each suction base allow for easy parent removal | set includes three suction bowls that stack neatly together for storage | top rack dishwasher-safe and bpa free | munchkin stay-put suction bowls - 3pk ideal for messy toddlers learning to feed themselves, your child will love the independence of the munchkin stay-put suction toddler bowls. 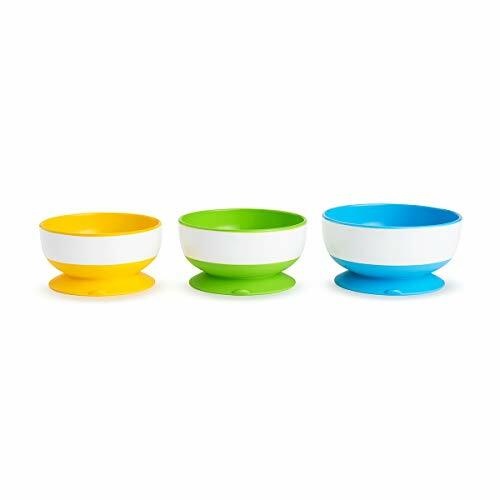 In three different sizes, each colorful bowl has a permanently attached suction base to help prevent spills. With the included lid, simply store your little one's leftovers in the fridge. 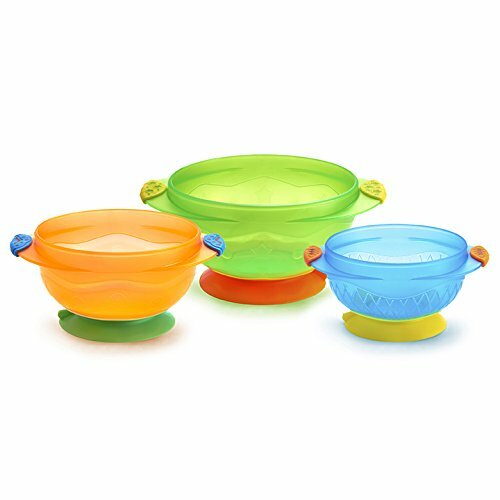 The toddler bowls are top rack dishwasher safe.